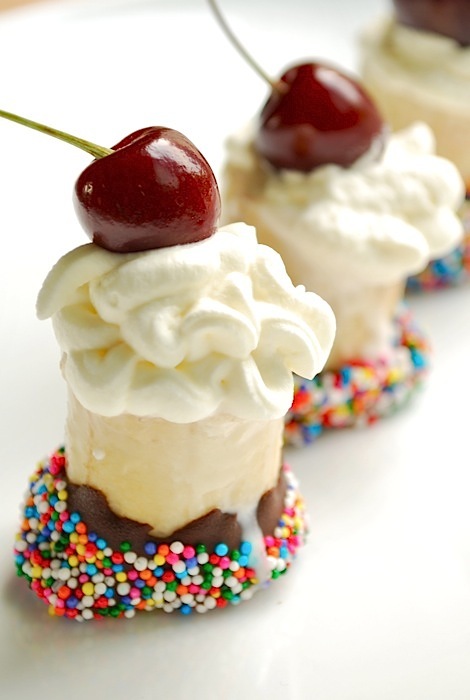 Ingredients: Chocolate, sprinkles, banana, whip cream, and cherries. Great party go to! All you need to do is cut banana's into 1.5 inch logs, melt down the chocolate of your choice (I used semi sweet) in a double boiler. Place a piece of wax or parchment paper on a pan or drying rack. Place sprinkles in a dipping bowl. When chocolate has melted, use a wooden kebab stick and dip the end of the banana in the chocolate and then into the sprinkles. Let them rest on the wax paper, when you finish place them in the fridge for 20 minutes. Serve and enjoy!